An effortlessly chic diamond solitaire ring crafted from classic 9ct white gold. A dazzling diamond solitaire is set within a pretty illusion setting, with diamond set detail on the shoulders for extra sparkle. The perfect ring for modern, sophisticated glamour. 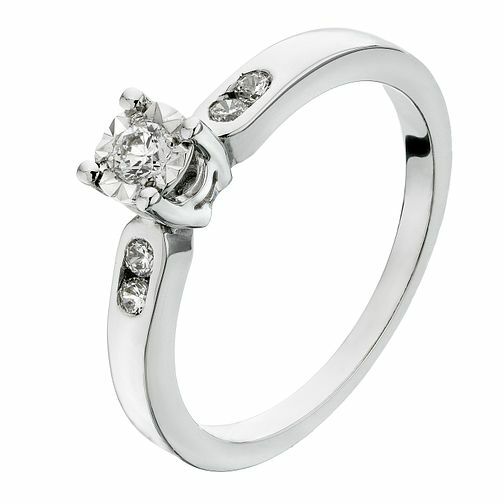 9ct White Gold Diamond Illusion Solitaire Ring is rated 5.0 out of 5 by 6. Rated 5 out of 5 by Anonymous from Stunningly Elegant This looks beautiful in the shop. Poor photo makes it look cheap, chunky and hideous. This is a stunning ring and is extremely elegant. Loved it so much we chose it as my engagement ring!